One of our most popular cottages, Throstle Cottage near Alnwick has been renovated to an impeccable standard and provides a luxurious bolt-hole for two for any time of the year. 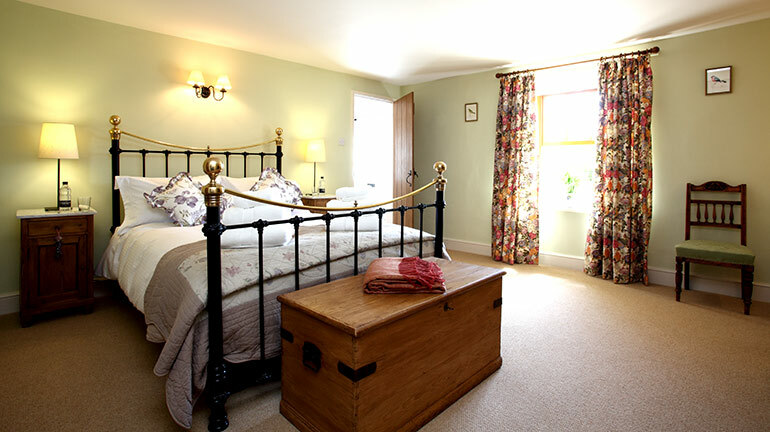 Cosy and comfortable, it has lots of original features and is situated in the picture-postcard pretty village of Lesbury and just yards from one of the best pubs in Northumberland, The Coach Inn. You can walk to the beach at Alnmouth alongside the winding River Aln from Throstle Cottage too in about 20 minutes. At Alnmouth there is a range of restaurants, gift shops, great dog-friendly pubs (The Red Lion has an amazing beer garden) and a renowned art gallery The Old School Gallery. Throstle cottage is a cosy Georgian cottage built around 1750 and perfectly situated in the conservation area of the pretty village of Lesbury. Lesbury is located close to Alnmouth and midway between Warkworth and Alnwick. The village sits on the banks of the winding River Aln and is a pleasant 1.5 miles walk or 5 minute drive to the sea. Throstle Cottage consists of the whole ground floor of a large Georgian Cottage. The upper floor is reserved for the owner’s private use, and they rarely stay at the same time as guests. Throstle Cottage has its own private entrance via the front door and there is a shared rear entrance into a rear hallway. Both residences have their own separate entrance doorways from inside the rear hallway. One of our most popular cottages, Throstle Cottage has been renovated to an impeccable standard and provides a luxurious bolt-hole for two for any time of the year. Cosy and comfortable, it has lots of original features and is situated in the picture-postcard pretty village of Lesbury and just yards from one of the best pubs in Northumberland, The Coach Inn. You can even walk to the beach alongside the winding River Aln from here too – what could be better? 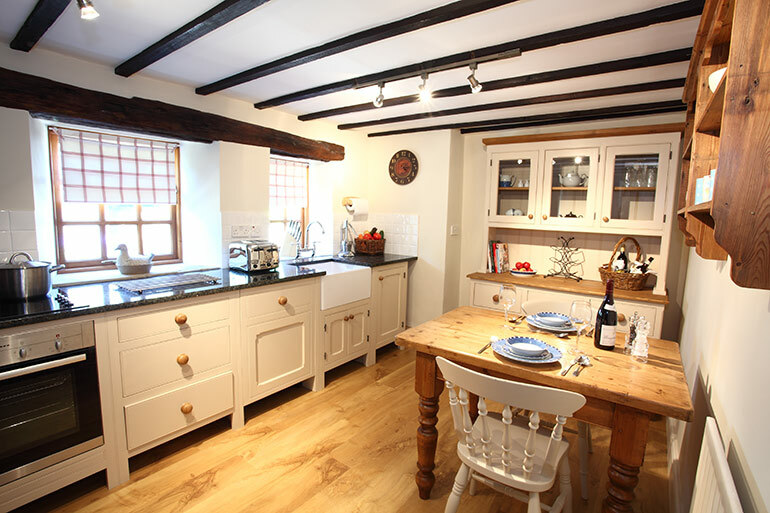 This lovely cottage sleeps 2 and one well-behaved dog is welcome. Graded 4 STAR by Visit England and granted a prestigious GOLD AWARD for excellence too. Free Wi-Fi. 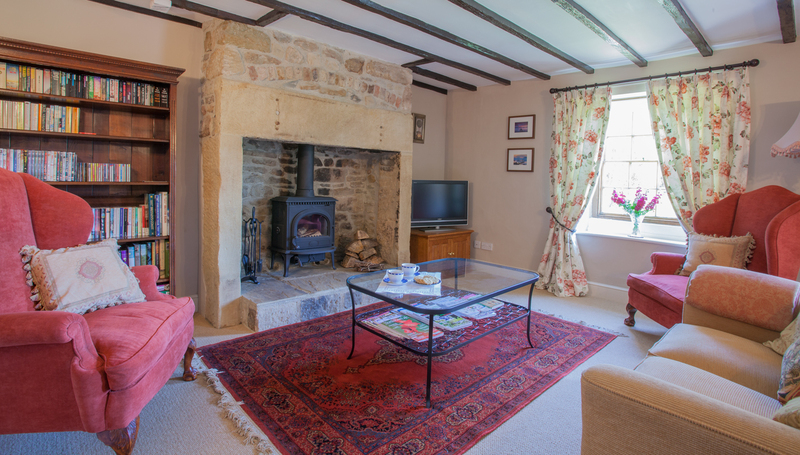 A spacious and comfortable south facing lounge with a original sandstone inglenook fireplace housing a wood-burning stove. Original sash window. Flat screen TV with digital channels, DVD player and hi-fi with iPod dock. Selection of books, music and DVD’s. Telephone accepting incoming calls only (outgoing calls to emergency and freephone numbers only). Mobile reception in the cottage is usually good. The kitchen is bespoke with granite work tops and a butler’s sink. Electric inset oven, ceramic hob, fridge/freezer. Microwave, toaster and kettle. Dishwasher. Dining table and chairs. Just off the kitchen is a useful laundry room with a sink, a washing machine and separate tumble dryer. Useful entrance from the rear patio area, where walking boots can be stored. This hallway is shared with the owners, when they occasionally stay in the upper floor residence, but the doors to Throstle Cottage are bolted from the inside for security. A spacious yet cosy room, it is south facing, so it’s light and airy all through the day. It has a fabulous king-size (5ft wide) cast iron bedstead with a luxury pocket sprung mattress for optimum comfort, luxury bed linen and towels. The original sandstone inglenook fireplace is a lovely decorative feature and not in use. Cot and highchair available upon request. DAB radio alarm clock with iPod dock. Hairdryer. A very spacious room with benefit of a walk-in shower and a superb freestanding slipper bath as well as a wash hand basin and WC. Towels and complimentary luxury toiletries from Arran Aromatics. To the south-facing front of the cottage is a pretty cottage garden, stocked with traditional herbaceous plants. The garden is perfect for sitting out or dining in the warmer months and is private, having a high evergreen hedge shielding it from the quiet village road. There is a garden bench seat as well as a separate small table and chairs. This lovely area catches the sun all day. To the rear of the cottage is a pretty patio garden with a table and chairs, which is for the owner’s private use, for when they use the upper residence as their own holiday retreat. However, guests of Throstle Cottage are most welcome to use this garden when the owners are not there. There is a useful hosepipe here for washing muddy boots and dogs. 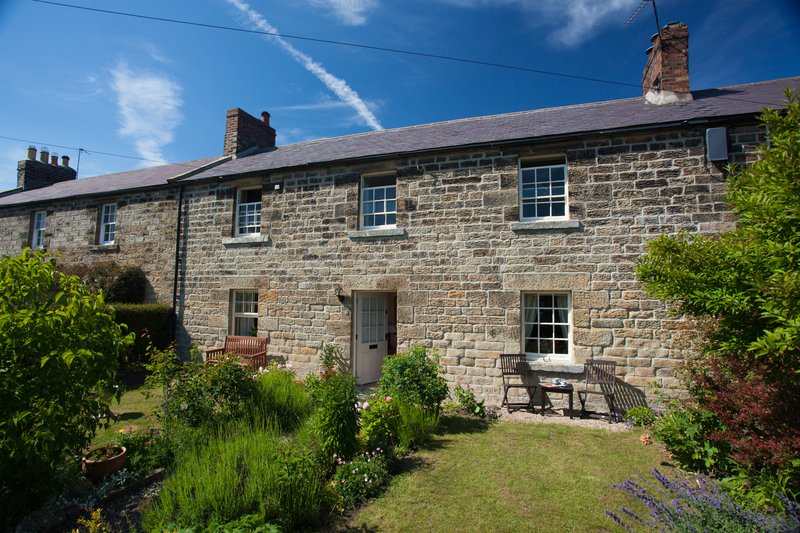 Throstle Cottage is the perfect, quintessential holiday cottage in the pretty village of Lesbury near Alnwick. The décor is a flawless combination of country cottage and modern home comforts, so you can truly relax in style. The perfect 'chocolate-box' cottage, south facing with a private, lawned garden at the front. Picture-postcard perfect. The gorgeous, farmhouse-style kitchen is well-stocked and perfect for cooking in on an evening. The cosy, spacious lounge has a beautiful inglenook sandstone fireplace with a large wood burning stove. A spacious yet cosy room, it is south facing, so it’s light and airy all through the day. It has a fabulous king-size cast iron bedstead with a luxury pocket sprung mattress for optimum comfort and luxury bed linen. The original sandstone inglenook fireplace is a lovely decorative feature. A very spacious room with benefit of a walk-in shower and a superb freestanding slipper bath as well as a wash hand basin and WC. Complimentary luxury toiletries from Arran Aromatics. Beautiful Lesbury river, part of our stunning countryside. Stunning Alnmouth bay from above. Luxury welcome hamper including luxury Arran Aromatics toiletries and bespoke Property and Area Guide. Wood burning stove and free Wi Fi. One dog welcome for £20 per holiday. Booking Conditions apply, see more details on our Dogs welcome page. Dog sitting service available, contact us to request. The pretty south-facing lawned garden is to the front of the cottage, with seating too. There is a hosepipe for washing down mucky boots and dogs! There is no BBQ provided at Throstle Cottage, but you are more than welcome to bring your own disposable one and use safely. Parking is on street in front of the cottage. One double room with a king size bed (5ft wide). Hairdryer. A feather duvet is provided on the bed. 2 x feather pillows and 2 x hypo-allergenic synthetic pillows are provided on the bed. An alternative hypo-allergenic synthetic duvet and 4 x hypo-allergenic synthetic pillows can be provided. If you require the entire bed to be made up with hypo-allergenic synthetic bedding and pillows, please inform us at the time of booking or a minimum of 7 days before your holiday. One bathroom with a large ‘slipper’ bath, shower, WC and basin with heated towel rail. Luxury towels and complimentary Arran Aromatics toiletries provided. Fridge/freezer, belfast sink, electric oven, ceramic hob, dishwasher, microwave, toaster and kettle. Washing machine, tumble dryer, iron, ironing board and vacuum. Hairdryer, books, music and films. TV in the lounge with an iPod dock/music system too. Accommodation on 1 floor. There is one step up to the front door and the rest of the accommodation is ground level. Please see the floor plan and 3D Virtual Tour for a detailed visual guide. There will be an initial supply of logs provided, along with kindling, firelighters and matches, for your first evening’s fire between the months of October and April. Further supplies can be purchased locally. There is strictly one dog permitted at Throstle Cottage with no flexibility. 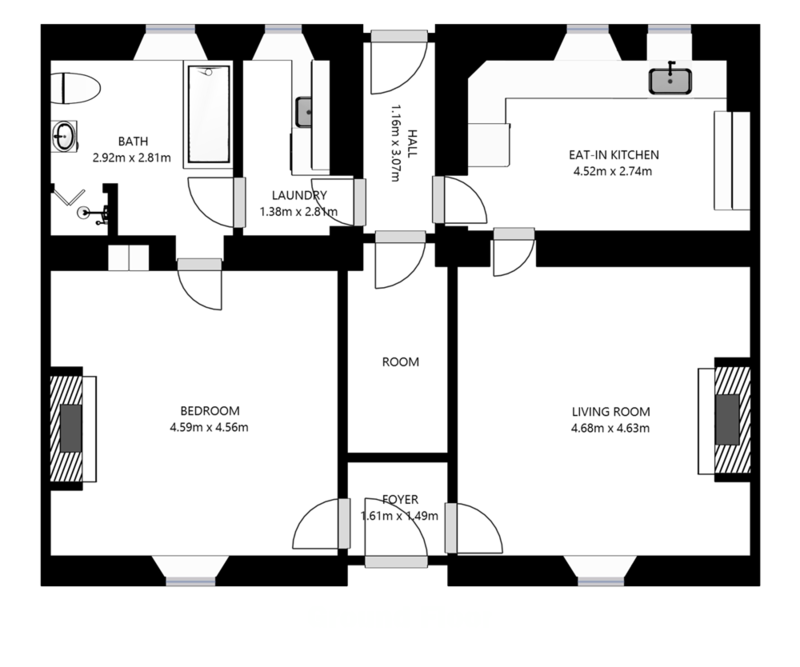 Here is a Virtual Tour and a Floorplan of Throstle Cottage. Throstle cottage is just yards from the locally renowned Coach Inn, which is highly regarded for serving delicious meals in hearty quantities. Just a few yards from the cottage is a traditional village store and post office. Alnwick is just 10 minutes north, where there are numerous fine restaurants, the world-famous book store ‘Barter Books’, Alnwick Castle and the world class attraction of Alnwick Garden and The Treehouse Restaurant. One of the walks to Alnmouth village takes you through the highly regarded 18 hole Foxton Golf Club, which is open to non members. Howick Hall and Gardens, the home of the famous Earls of Grey (one of which devised the now world famous Earl Grey tea) is less than 5 miles away. Craster, famous for its smoked kippers is just a few minute’s further up the coast, followed by the beautiful Embleton Bay with Dunstanburgh Castle at its southern end. The delightful village of Warkworth is just 4 miles south of Lesbury, where there is a good range of pubs, restaurants, cafes, lovely quirky shops and art galleries. The magnificent castle is fascinating to explore and there are lovely riverside walks, where the River Coquet encircles the village before meandering out to sea. To find out the distance of this cottage from your own home, how long it will take to drive there and other options for alternative transport, click here: Throstle Cottage and enter your home postcode. The postcode for Throstle Cottage is NE66 3PR. We have a very nice, high quality home, so when we go away on holiday we do not want a drop in standards. Throstle Cottage did not disappoint us. The owner paid attention to all details including kindly leaving us a bottle of Champagne and card wishing us a Happy Anniversary and also phoning us on our arrival. Excellent. Easy and efficient booking system. Walk to Alnmouth beach from the cottage, as it only takes around 20 minutes on foot. Alnmouth beach is a stunning stretch of several miles of golden sandy beach. Dogs are welcome on the whole beach all year round, and you can pop into the one of the pubs for a hearty pub lunch after a brisk walk – we recommend The Sun Inn and The Red Lion because your dog can join you too! Have a drive up the coastal route, to reach the villages of Embleton, Craster, Beadnell, Seahouses and Bamburgh. Embleton beach is beautiful and Howick Hall and Gardens near Craster is stunning – a bit of a hidden gem here in Northumberland. Pop along to Bertrams in Warkworth for breakfast and finish off with a stroll along the river around the village. Their breakfasts are delicious and their rolled porridge oats with fresh cream and berries is to die for. They also do a mean hot chocolate and fresh local smoked Craster Kippers – always the answer after a winter walk on the beach. 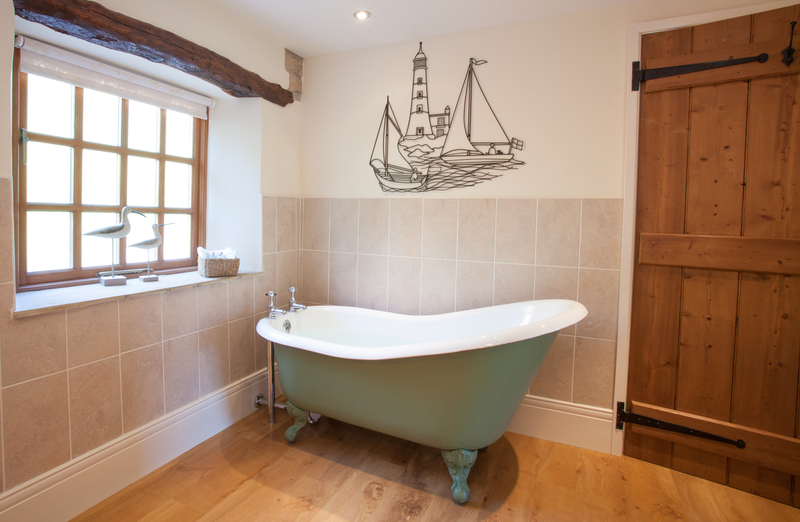 “We fell in love with Throstle Cottage as soon as we saw it. 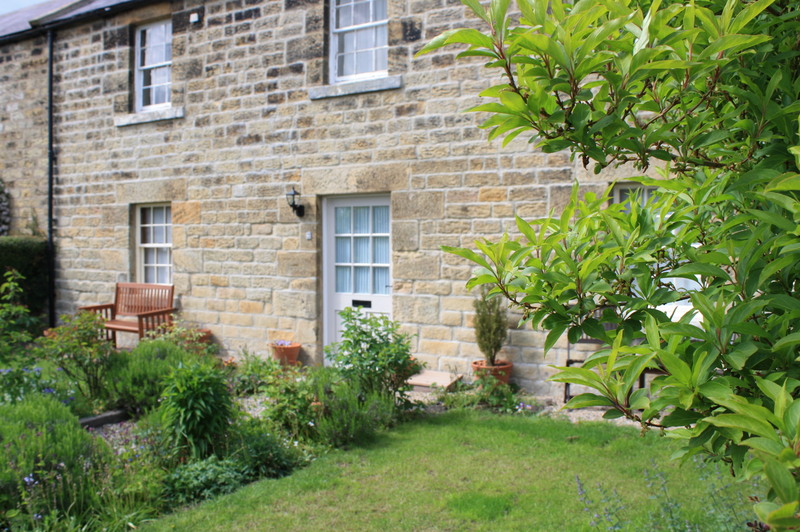 For us it is the quintessential country cottage in a beautiful unspoilt Northumbrian village near the sea. Perfect.